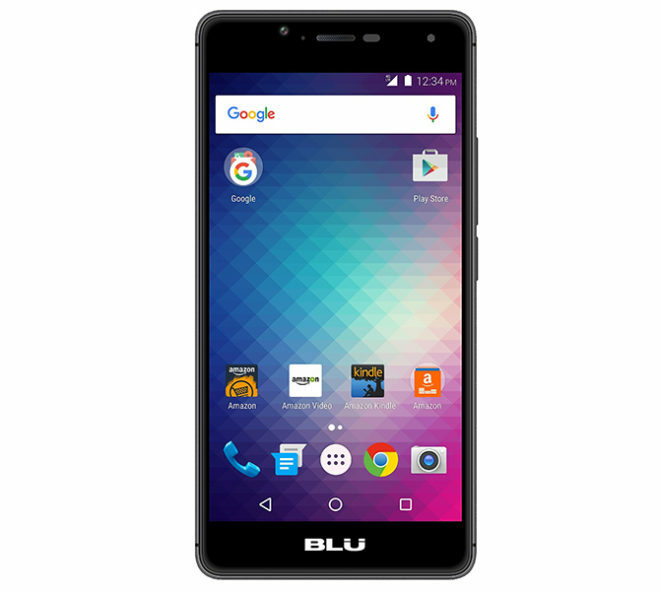 When BLU launched the R1 HD earlier this year, it said that the R1 HD would eventually be updated with support for T-Mobile’s band 12 LTE and VoLTE. That update appears to be rolling out now. TmoNews reader Edwin reached out to me today to say that a new update is rolling out to his Amazon BLU R1 HD. 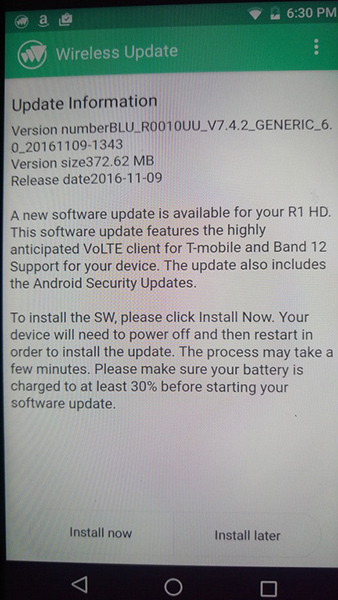 As you can see in the image below, the update specifically calls out support for T-Mobile VoLTE and band 12. Also included are Android security patches. The update weighs in at 372.62MB. If you’ve got an R1 HD, you can check for a software update by going into Settings > About Device > Wireless Update. The BLU R1 HD is an attractive device because with Amazon’s Prime Exclusive program, it can be had for as little as $49.99 — though it’s currently unavailable from Amazon — and it’s got some decent specs for that price. Now that it’s got VoLTE and band 12 support, the R1 HD is even more enticing to T-Mobile customers because it works with two important T-Mo network features. No no, with this new update you may speak on the phone while your data gets sent to China via a much faster LTE service. It really speeds up the spying. Yeah, you may want to report about the entire sending texts to China thing. Is that patched in this update? I’m not sure that VoLTE is working properly. When I run LTE Discovery and it list I’m on band 12. I then make a phone call the phone loses LTE connection according to LTE Discovery app. I made a phone call with this new update and it switch to EDGE . while i was talking on the cell . Correct i saw no xakking in the update lol. Anyone with the OEM R0031UU 16GB/2GB ram OEM Blu R1 HD received this OTA update yet? I have not received it yet. I’ve been checking every day for the past 3 months for this update. Now that I know its in the wild, I will be checking every few hours. I’m seeing people post issues with VoLTE, so they might have pulled the update. I really hope to have this by next week, when I travel to areas I know are Band 12 only. Data still going back to China through the backdoor. Isn’t BLU owned by a brazilian jew? I don’t go to communist websites. Yeah you are the 49% that likes fake news. Ironic that you even know how to comment on tech. On what basis are you saying this? After I did the update, I checked and have the version of Wireless Update BLU is reporting fixes the China problem. Are you hearing from anyone authoritative that BLU is lying? Slightly OT, been wanting to get the ZTE Axon 7. Any sources on that phone in particular as far as the China spying thing whether yay or nay? The reviews are good (except for the camera and no wifi calling) and the price is great but I’m concerned. Any advice? Yep,They really want to know about what we had for lunch,that movie we going to see,that cat video,they really have exciting lives back in China!! !